Alandra Hileman’s Theatre Rule of the Month: If you act like it’s intentional, no one will know it’s a mistake. I feel like my last couple blogs have been sort of downers, so today I wanna talk about something more fun and positive: mistakes! I love technical mistakes in theatre. Love them. When they’re in someone else’s show, this is often the schadenfreude of “I’m so glad I don’t have to solve this, but let’s see what their stage manager (or whoever) does.” If it’s in a show I’m not enjoying, technical flubs sometime re-pique my interest in what I’m watching. And if it’s my own show, even though there is sometimes panic, there is also a bit of an adrenaline thrill that comes with trying to solve a problem on the fly. But my absolute favorite thing about technical mistakes is when they are covered well. Sometimes it’s a mistake that is obvious, but I enjoy the skill of cover as much as I would have enjoyed the actual effect. I was recently at the premiere weekend of a new stage show attraction that plays at a popular theme park run by a giant mouse. This show is based on an animated film, of course, and involved one incredibly specific quick-change for the lead character in which her dress transforms min-song, much like the current Broadway Cinderella dress transformation but with more icicles. The performance I saw reached the big musical swell after the bridge of the song, there was a lot of twinkling and flashing lights, everything blinks to black for not more than two seconds and then the lights popped up – the dress hadn’t changed. I could see that the actress had tried to trigger it, but something hadn’t worked. However, to her credit, the actress just continued to sing the huge final verse of her song, and very simply, at the end of every line where there was a sort of instrumental punctuation, she would subtly tug the release until finally, with two lines of song left and in full view, the release “let it go” and the dress transformed, right at a big musical swell. The actress was relieved, the audience was thrilled, and the show didn’t miss a single beat. The other best kind of technical mistake is the one covered so well that even someone like me, a veteran SM with years of technical experience and just a generally observant person, doesn’t even realize it’s a cover. Just last night, I was at a show and in the first scene the lead actress is supposed to have a laptop which doubles as a prop and lighting source. In the course of the banter between her and her stage husband, they begin looking for the laptop, until she sent him into another “room” of the house and he returned with it. Realistic married life, right? Nope! I found out from the SM later that the laptop had been left charging backstage, but the actors were so entirely unfazed when they realized what had happened that they created a perfectly in-character scenario that would allow the ASM backstage to hand it off. Those are just two incredibly recent examples, but I have dozens of war stories about technical flubs, good and bad, and the often ingenious ways in which they were resolved. 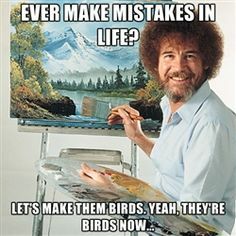 I’m sure I’m not the only one, so please comment with your own favorite flubs and covers, and let’s find the joy in mistakes!